Last year WPW made some noise after posting this article, disputing the truth of Louisville Slugger’s claim that they were the #1 bat at the 2013 All Star Game. After researching it we concluded that Louisville was not, in fact, #1, but it was Marucci, swung by 12 players to Louisville’s 11. The upset came with a bit of controversy though, as a reader pointed out that Edwin Encarnacion swung Louisville that night. Being that we pay attention to this type of thing, I knew that was atypical for Encarnacion, who had been swinging Marucci exclusively going back several seasons, and continues to do so to this day. 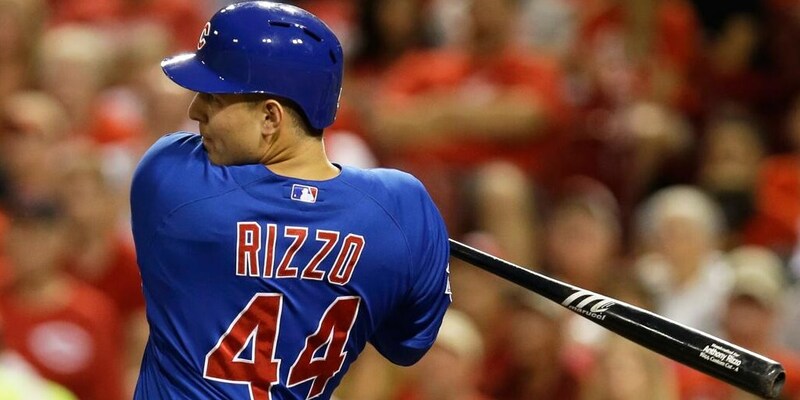 So why would a loyal Marucci guy randomly pick up a Slugger in the All Star Game? After that article, I got a call from USA Today’s Ray Glier, who was intrigued by the “upset” and wanted to check my numbers. He wanted to write a story about it. I told him my numbers, and by the time it went to print, Ray told me that he found out Edwin went to bat with Louisville, so my numbers were inaccurate and had to be removed from the story. We’re back, 365 days later, and we’ve got another count for you. This time, there is no controversy. It was a landslide, and a historic one at that. Here’s a breakdown of every guy to the finest detail, his brand and model, along with measurements where possible (and links to buy where available). I watched every AB, scoured Getty Images, did whatever I had to do to leave no doubt. There you have it. Marucci left no doubt this year, with 11 more bats than their rival, Louisville Slugger, and 45% of the entire field. A decisive victory and one that has been years in the making. 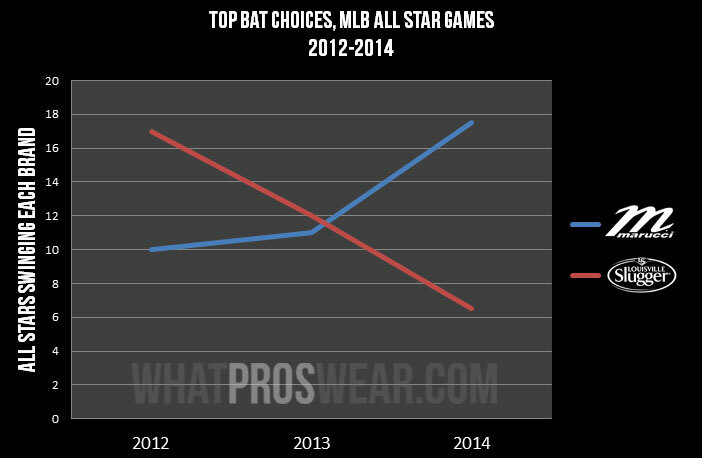 As you can see in the chart above, we looked back to the 2012 All Star Game to see if we could spot any trends, and now that the 2014 results are in, we’ve got a pretty telling story. Since the first All Star Game in 1933 (and for at least a decade before that), Louisville Slugger has been the choice among baseball royalty, and until these last three seasons, it was never even close. To put that 90+ year run in context with other top sports brands, look at Nike, who seems to have been running the basketball shoe market for an eternity, but in reality it hasn’t even been 30 years. Or a company like Titleist, whose name seems as much a part of golf as fairways and sand traps, who became the top ball at the US Open for the first time in 1949, 65 years ago. 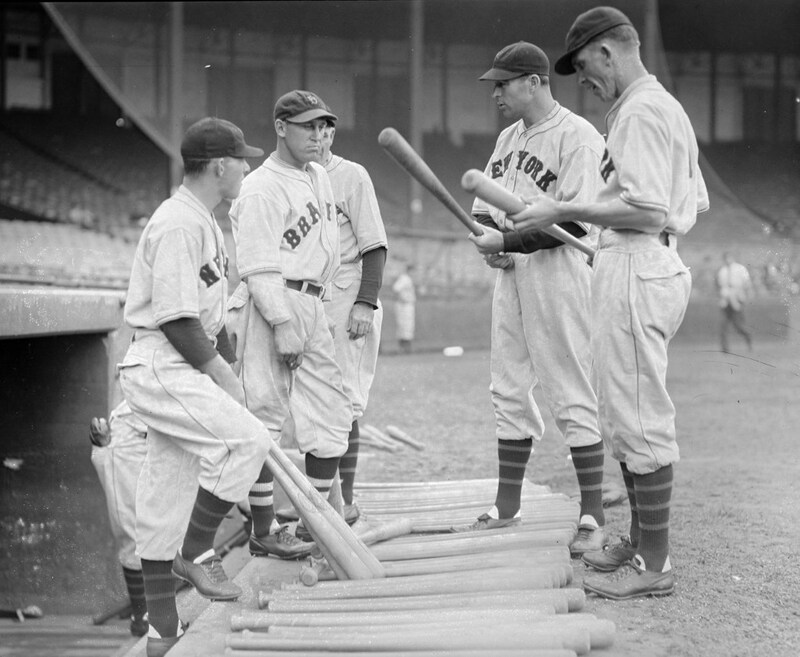 Mel Ott (left) and other New York Giants talk Slugger with Boston Braves, 1933. Courtesy of the Boston Public Library, Leslie Jones Collection. Its Louisville’s unparalleled dynastic success that makes Marucci’s rise so remarkable. The underdog story began when Cardinals’ Eduardo Perez lined out to SS on June 25, 2003. Just eleven years later, 45% of the game’s elite players are converted. Whether you’re a Louisville, Marucci, Old Hick, or a Chandler guy, its obvious that this is a pivotal moment for the pro wood bat industry. Will Marucci, now the top dog, be able to fight off Louisville with a target on their backs? Will Louisville be able to get back up off the mat and take back what is theirs? Is this the beginning of a tug-of-war between the two lumber kings? Or is there another underdog coming for the top spot? MINE bats and European Beech is going to take over the league, mark my words!